But they’re still rolling along! The carnival entry for RC Ramsgate recently in the Ramsgate Town Carnival was President Simon Wallace’s three-wheel motorcycle. Sorry petrolheads, they haven’t told me the make, engine size or whether it is hugh and rohrty, or just rather naughty! This was a first for the club. He was joined by his wife Tina and other club members, here seen modelling their rather fetching dayglo tabards! Including the club mascot. Do they do dog tabards? 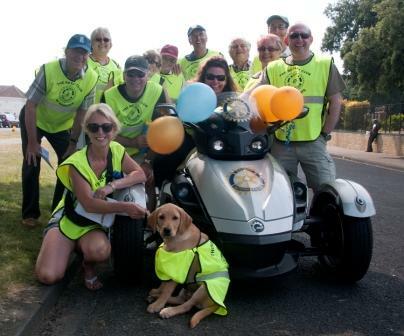 They used it as a Rotary awareness raising excercise, handing out membership leaflets to the carnival-goers, and inviting them to help join in our mix of fun, fellowship, and fundraising! Well done Ramsgate! (See also Ramsgate team for the Herne Bay Abseiling fest on the FaceBook page album). A team of eight, including 4 Rotarians from the Rotary Club of Ramsgate are to tackle the Three Peaks Challenge over the weekend 31st. August to 2nd. September. One of their number –Joanna Jerden, one of the Rotarian’s wives has been diagnosed with Amyloidosis, a life-threatening disease. Their target is a figure of £23K, of which they have already raised nearly £3K. This money will be used to buy a ‘Coverslipper’ machine for UCL (University College London), who are engaged in research into this field. The others in the group are all relatives or friends. Four of the eight are Rotarians from Rotary Club of Ramsgate. They will be supported during the Challenge by a minibus donated by CMW Group of Dover. Two other volunteers are doing the driving. (R) after their name denotes a Rotarian. Fiona Hawley is Joanna’s sister and is travelling from the U.S.A. to take part. From Francis Hodge – MPRC Chair District 1120 Rotary Int. Information above is accurate at time of transmission.